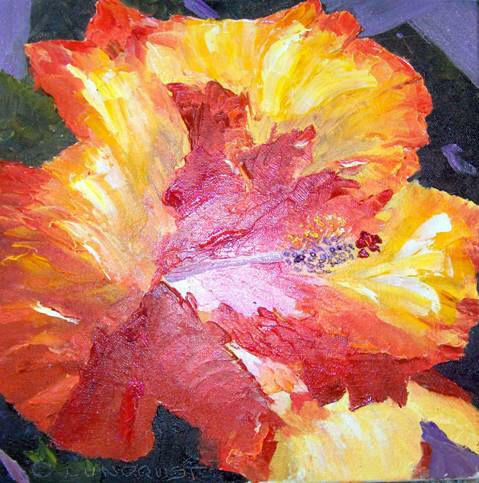 Dawn Lundquist is an American artist painting Hawaiian seascapes, various flora and other, less conventional themes. She publishes her work on her website, Lundquiststudios, which offers for sale original pieces as well as prints and Giclees. Read more about Dawn Lundquist on her about page. In today’s review I would like to discuss the artist’s florals. Arguably the most dominant stylistic feature in these paintings is the dense, overflowing use of color. It appears to trickle down from the petals and paint the air; the flowers seem to be sweating hue, so thick and generous are the patches of deep blue, red, white and orange. Usually only two or three main colors constitute the entire palette; they interchange and create intense compositions (usually relying on radial symmetry). The color technique leaves less room for air and light, which are subsequently of diminished importance here. As a result, the atmosphere may appear as particularly heavy, humid and sticky; since these qualities indeed characterize tropical locations, it remains to conclude that the extraordinary density of color ensues from a necessity dictated by the climate conditions (I love it when everything falls in place like that — for me, this is the mark of good art). 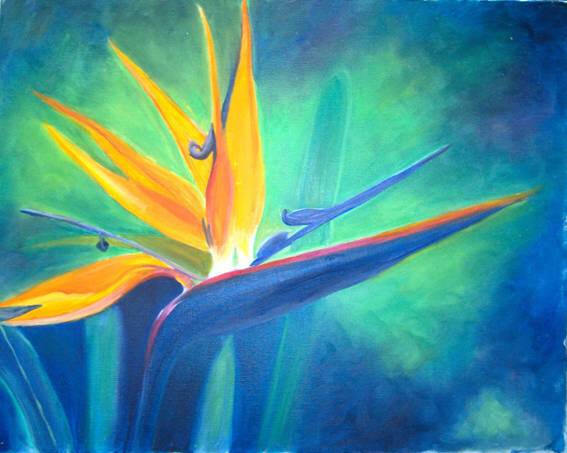 Although each painting usually shows only one single flower, the overall impression is of being submerged into a jungle. As it often happens when color takes precedence, the painterly vanquishes nearly all traces of the linear. These are the antidote to a botanical illustration: the emphasis here is on the unified whole, on the movement of humid air that soaks the painted surface and on a mystical luminescence that all but evokes mythical contemplation on the emergence of life. Unusual viewing angles and an unclear generic status — in most cases it is impossible to determine whether the flowers are still life or still growing — contribute to the mystical mood. Furthermore, the lack of detail disrupts scale perception and the flowers may appear like giants slowly moving through air. Everything seems to conspire to convey something magical. In a contrary turn, these florals succeed also in something more real and tangible: the depicted richness overstimulates the visual perception as to overflow and arouse, if only in one’s mind, other senses — particularly the sense of smell. 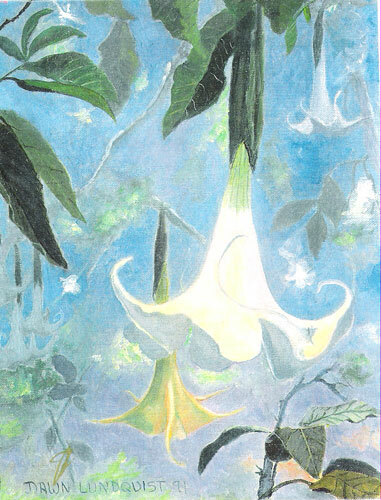 The Angel’s Trumpet you see above may seem to spread faint tinkling and accompany its heavenly ambiance. Regardless of one’s readiness to accept such interpretation, ignoring the sensuous abundance — naturally predisposed to engage other senses — would be unfair. These flowers want to smell and sound — and who are we to stop them? I have three of Dawn’s paintings in my apartment and would love a few more…..
@Elyse — and thank you!